Recommended Citation: Bhatia, S and J D Arthur. 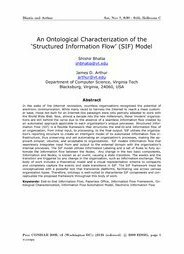 An Ontological Characterization of the ‘Structured Information Flow’ (SIF) Model. In The Proceedings of the Conference on Information Systems Applied Research 2009, v 2 (Washington DC): §3125. ISSN: 0000-0000. In the wake of the Internet revolution, countless organizations recognized the potential of electronic communication. While many raced to harness the Internet to reach a mass customer base, those not built for an Internet-like paradigm were only partially adapted to work with the World Wide Web. Now, almost a decade into the new millennium, those ‘modern’ organizations are still behind the curve due to the absence of a seamless Information flow created by an automated approach applicable to each organization’s unique processes. Structured Information Flow (SIF) is a flexible framework that structures the end-to-end Information flow of an organization, from initial input, to processing, to the final output. SIF utilizes the organization’s reporting structure to create an intelligent model of its automated Information flow infrastructure, thus preserving and yet automating an organization’s processes, making the approach simpler, intuitive, and acceptable to organizations. SIF models Information flow that seamlessly integrates input from and output to the external domain with the organization’s internal processes. The SIF model utilizes Information Labeling and a set of Rules to fully automate the Information flow between the Nodes. Any change in the two basic components, Information and Nodes, is known as an event, causing a state transition. The events and the transition are triggered by any change in the organization, such as Information exchange. This body of work includes a theoretical model and a visual representation schema to compactly and completely capture the events and state transitions in SIF. The SIF framework must be conceptualized with a powerful tool that transcends platforms, facilitating use across various organization types. Therefore, ontology is well-suited to characterize SIF components and conceptualize the proposed framework throughout this body of work.